A usual yellow and dusty day in Cairo. The continuous noise of horns, the wind blows up city garbage that litters the streets, and the prickly drifting sand mixed with burning and exhausts penetrates into the skin, eyes, ears, and nose. It is time to wear a niqab and wrap a turban scarf, which the Egyptians use to save from the local climate. Urban districts of Tabba, Zahra, Arba Wa Nus, El Rehab, and Nasr City are the traditional refuge for students from the Caucasus, studying at Islamic universities. According to official data, there are about five thousand of them here. Whether the desire to become a spiritual figure or ambition to learn Arabic or craving for the primary sources of religion leads the Russians here, they all face similar problems. On the one hand, the visa regime in Egypt is quite strict, on the other hand, very “leaky”. It makes visitors easy prey for the police. When entering the country, visa for a period of thirty days, which costs $25, is pasted in the passport. Those willing to be enrolled in the Islamic Al-Azhar University in Cairo are in a hurry to apply before the end of the visa, which is a prerequisite. After that, the “adventures of students in Africa” begin. The language course they attend waiting for admission to the University does not provide documents for legal stay in the country. Al-Azhar itself may delay the answer for six months, and then protract the issuance of a visa for some time. Thus, an applicant inevitably turns into an illegal immigrant. They are caught and expelled from the country. Three months without registration turn into a fine of one hundred dollars, and of another thirty dollars every next three months. Interestingly, this violation does not prevent from re-entering Egypt at all hours. Buy another visa and be free. Meanwhile, there is the state of emergency in Egypt, which is extended every three months by the authorities. 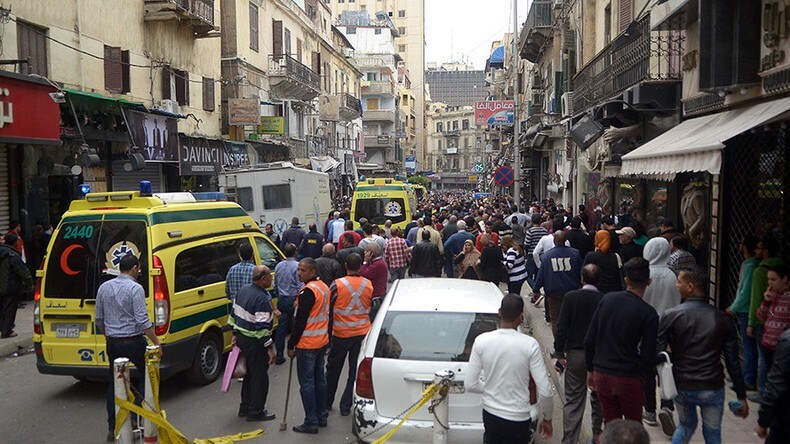 It was introduced in the spring of 2017 in connection with the major terrorist attacks in Tanta and Alexandria. Suicide bombers blew themselves up then during the celebration of Christian Palm Sunday. 45 people became victims; more than 120 were injured. The “Islamic State” terrorist group declared its authorship of the crimes. The law on the state of emergency gives unlimited powers to law enforcement agencies. The latter, apparently, used to enjoy full freedom, because the regime had been constantly active in Egypt from 1981 to 2012 and was canceled only upon the request of protesters during the “Arab Spring”, which also led to the resignation of the President Hosni Mubarak. Officially, the armed forces and the police are obliged “to take measures to counter the threat of terrorism, to suppress the sources of its financing, as well as to take care of the security of citizens and the inviolability of state and private property.” However, in fact, raids to find people without a visa or, as is said here, iqama (registration), are carried out by the lowest level of the police despised by the people. Their methods, justified by the state of emergency, violate international law, the Convention for the Protection of Children and other civilized norms, the observance of which Egypt has assumed. In August last year, several Ingush students had the bad luck to become the target of a police raid. As always happens in such cases, the news of the detention of fellow compatriots instantly spread among the Egyptian Caucasians. At that time, a woman with three small children, the wife of one of the students, was also imprisoned. This had never happened before. There was a fuss, and within a week, several people, including the detained woman with children, were released. Out of prison, they told about the inhuman conditions, in which detainees had been put, including children. Almost nothing has been known about the fate of five more detainees for many months. And no, not all of them were in Egypt illegally. Two of them had valid documents. That did not save them from persecution and their complete disappearance. They lived in Arba Wa Nus, which means “four and a half,” Cairo slum district, where the police are very frequent visitors at any hour of the day or night. Many Russian students live there because of the low cost of accommodation. This name became almost appellative in their environment, combining total disorder, the dependence of people on chance success and rightlessness before the police, night insomnia with enabled WhatsApp waiting for messages about raids, the fear for family and the desire to pass exams quickly and leave. We are sitting in a small café with three Ingush students of Al-Azhar University. They are extremely afraid of the publicity of their names and participation in the conversation with the journalist, so let us call them Ibrahim, Iskhaq, and Jakub. 1. Ismail Chemurziev, 24 years old. Completed Arabic language course in the Al-Fajr Center and in a week, was going to fly home. He already had a ticket. 2. Khizir Dugiev, 22 years old. Was a student at Medina University, but arrived in Cairo for the summer holidays to improve his Arabic. He stopped at Chemurziev’s place. Probably without a registration, because he did not plan to stay for a long time. 3. Ilez Auchev. The only family man of the five. He had no registration, his wife had. Attended a language course. 4. Ali Dzeitov, 22 years old. My interlocutors are familiar with him since childhood. They talk about him as a modest and diligent student. He stayed in Cairo without a registration. 5. Ramazan Pliev, 23 years old. Lived with Dzeitov, and studied the Arabic language. The students testify that the August raid was strange compared to the previous ones. Usually, patrol officers look for violators on the streets or interview building entrance cleaners, voluntary agents of the police. Many raids took place in December. According to the students, this was related to the reporting at the end of the year. Special services have data on how many foreigners entered Egypt, and how many of them received a registration. The rest are illegals, and there is a need to find them. However, on August 14, at about 5 p.m., security forces silently and purposefully came at once in multiple locations and took people away. “The first couple of days after the arrest, it makes no sense to do anything. Usually, detainees themselves get in touch. They borrow a phone from their inmates or already report about deportation. The police also usually do not hide the fact that there are people in the police department. Someone carries deliveries to them because the police do not feed them, except stale bread,” Jakub explains. But in this case, none of the police departments acknowledged that they had five Ingush detainees. Mukhabarat, the General Intelligence Directorate of Egypt, also sews up its mouth. “If a person has done something, then why is it necessary to keep it missing for six months?” Ibrahim asks. My interlocutors feared the continuation of repression, but what happened had not been there before; a woman with children was arrested. It was decided to not be silent, and to act immediately. We went through the police departments and filed an application about the loss of people in the Russian Embassy. Thus, according to the students, the diplomatic mission was initially aware of the case. Looking ahead, I would like to say that the Ingush officials met with the Egyptian Ambassador to Russia only in January, when there was no news about the students for five months. “We hired Egyptian attorneys, hoping to find the guys with their help. Nothing worked. The attorneys took the job and just gave it up saying the case was extremely difficult,” Iskhaq recalls. For the last six months, a large part of students have chosen to leave Egypt. Primarily, due to the lack of security. A small survey among Caucasian students in Cairo showed: a large portion of raids and police harassments fall on Salafis. Sufis, even without a registration, live a much calmer life. Perhaps, this is due to the fact that the Salafis are more often suspected of sympathy for the terrorists of ISIS and Ikhwans, members of the “Muslim Brotherhood” organization now banned in Egypt. According to some reports, the natives of the Caucasus were found among the militants of the ISIS cell operating in the Sinai, a big pain in the neck for the Egyptian authorities. Meanwhile, three of my counterparts, professing just the same Salafism, assured that neither they nor the missing Ingushes, nor anyone else they know or among their fellow compatriots in Egypt, do not support the radical ideas of these organizations. “We have an unspoken agreement: if we know that some of our fellow compatriots arrived to war, instead of studying, or want to join an armed group, we “deport” them at our own. We contact their parents and send them home,” Ibrahim, Iskhaq, and Jakub told me. trying to resolve the situation with the arrested students since the moment they learned about the detention. “We have information that five Ingushes are safe and sound, but there is no opportunity to call on them and check the conditions of their detention. We use diplomatic tools and cannot press on Egyptian officials. We write requests, ask for visits, but they do not always respond quickly. We tell the Egyptian side: if the five detainees are criminals, they are our enemies as well as yours. We have a common objective, to fight against terrorism. And we want to know what our citizens are suspected of. If they are to be silently deported “for security reasons”, this could mean anything from alcoholism to terrorism. If they are charged, the investigation may take a year and a half. “To torture” is a broad concept. Our students are beaten there, but then released; they go home and soon return. So, they were not battered that hard, were they? Ingush human rights activists from the “Mashr” organization supported the release of fellow compatriots in the first weeks after the arrest. They brought the situation to the attention of the press and contacted the families of the missing people with journalists. Moreover, they made requests for search in all conceivable instances. Local television has reported on this event, though! The Ingush representative met with Egyptian Ambassador Ihab Ahmed Talaat Nasr on 11 January. The Egyptian promised to investigate and establish the location of the Ingushes. And now, the entire world may count down with interest: how much time should the government of Egypt spend to track down as much as five foreign nationals in their dungeons and to find out the reasons for their arrest? At the same time, the republican authorities have used the trouble to strengthen the control over the population. “In the near future, it is necessary to create a special organization in the Republic, where young people willing to go abroad for religious education would be able to receive the necessary advice on this issue and would be tested by law enforcement agencies,” said the Ingush Head Yevkurov. As if Russia is lacking “special organizations” complicating people’s lives! He also instructed his officials to monitor the behavior and even academic performance of Ingush students abroad. Well, not bad. All that is left to do is find them.